Webster Thailand is now on the OU Campus platform. 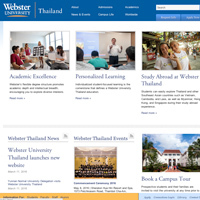 Webster University Thailand relaunched its website this week with the aim of enhancing the user experience by offering more easily accessible, user friendly and social media optimized resources for students, faculty and staff. The completed project is the result of several months of collaboration between the marketing and information technology staff at Webster's Thailand, Geneva and St. Louis campuses. After Geneva relaunched last year, Thailand becomes the second international campus in the Webster network to come online with the OU Campus content management system that is already used by Webster's U.S. campus locations. OU Campus, developed by OmniUpdate is the leading web content management system (CMS) and digital marketing solution for higher education institutions. Today, it is used to manage more than 700 of the world's finest college and university websites.